How is everybody doing? A little louder! I'm going to have to rally up the crowd for the last visitor, former Secretary Sebelius. It is wonderful to be here today with all of you and so many of the team, a special welcome for those watching via web cast, we have 750 people who are watching online. Can you believe that? Nice to see a lot of familiar faces and new faces, thank you for being a part of this not only work today, but part of our journey in health IT. I want to take a minute to acknowledge the ONC grantees in the audience today, this is where I do the part where you get to stand up. Can I have the former REC grantee stand up because of the work you have done to move so rapidly toward adoption. Thank you. So we have old and new, we have those that work in part of the workforce development, they are in the process of bringing those folks into health IT, so if you are in the room, please stand and be recognized. And then we had a grant announced last year to bring in new sources of data and providers, whether they were from EMS, social services, or behavioral health and those grantees went through a competitive process too. If you could please stand and be recognized. And finally, the folks from the Hill, some are here, and you have seen the videos. These folks on The Hill have been terrific partners at helping us think about how we build on the foundation of health IT to a brighter future to everyone. This is a meeting I look forward to because it is a chance to see so many old friends. 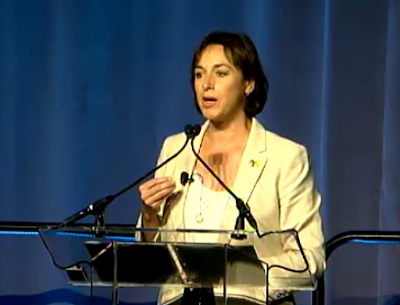 I used to be a grantee of ONC, so I got to stand up and I want to recognize what the work is like in the field, it is tough and we are changing technology and culture and this is a chance to bring you into one place so you can learn from each other and those that we are here to serve, the consumers on the third day of the event. We have been doing a tremendous amount of work in a short period of time in a dizzying pace and we can see that not only can we digitize the care and health experience of every American, but we are reaching a place where that data is going to be available when and where it matters most. We have seen progress in the data with EHR adoption and it is worth taking a moment to look at this from the brief we put out today, from the American hospital association, they are great partners in helping us keep track of the progress we are making. When ONC was started by President Bush, the charge was to see that every American would have access to their electronic health information and this has been carried forward by President Obama and with the passage of the high-tech act in 2009 and we have been working, all of us, all of you out there watching, on seeing that we can have a digital record of the care experience that people in this country, and I think it is so important for us to take a moment to recognize that we have made significant advancements in the goal I rode out. And I will go way back before 2008 and tell you that, when I was training at Charity Hospital as a medical student in the early 90s, one of my jobs was to go to the lab floor where there were wooden boxes and pull out the labs for the patients today, they were written on carbon copies, this is the potassium, and then we would prescribe it to the patient and move it down the line, and that process happened during my career, and you think about where we are today, that some of you all might be checking your patient's labs on your smart phone to see the results, that is a great opportunity clinically for those of us practicing and there's a lot of unexpected challenges and opportunities that you have heard about. This EHR adoption rate, it is 9 times the rate that we were at in 2008, is the beginning of the journey that we are taking. As a doctor, as a daughter, and a policy maker, I know that we need to see that actionable, usable, electronic health information is available when and where it matters to consumers and all of us who are users of that data and it is coming from so many sources today, even compared to where it was in 2008 when we started measuring. It is all sorts of information and our chapter ahead is to bring it all together to make it usable and actionable for everybody that wants it. This is what I hear loudly and clearly: Everywhere I go, in every community where I have a listening session or visit a clinic or health center or hospital or scientific environment or public health agency or any place we go, what the people of the country they are ready for is the electronic health information to be available when and where it matters to them. They are impatient with the progress and they want the data to be free, thank you John White. It is also something we are hearing increasingly from scientists, you are hearing about the use for precision management and moon shot, and we are hearing it from the President and the Vice President, that the time is now to build on the success of adoption that we have already seen. The office of national coordinator believes that this is a process moving forward that will require the partnership with the private sector and all of our federal partners. We have taken an approach that is about public/private partnership, a shared vision and strategy ahead, we laid out around interoperability and we said what we wid do by when and when the private sector and states ask weigh in. And I want to thank everyone, including the federal partners, states, private sector and individuals that have stepped forward to meet those expectations, whether working on patient identification, or creating apps or maturing fire, it is all of us working together to get to the kind of health system we are all dreaming of. The way that we have been boiling down the way we are thinking of moving forward, Dr. Washington shared this morning, this is the 3 Cs, common standards, culture change, and a business case for data to move. As we think about the work we have laid out, whether it is high-level like the federal health IT strategic plan or in the road map and understanding how we need to move forward on key critical path issues and taking what we have learned in the field, these areas capture the most important and impactful work that we need to be doing every day at ONC. And just as we are celebrating the success of adoption, we are still seeing challenges in the integration of data, and we have so much work in an ecosystem that itself is interoperable. We want to work to where we have on the same language, so there is no frustration and expense of not having national standards, and creating opportunities to advance new kinds of standards that can advance the field. The first area includes, most importantly for us, the notions of privacy and cybersecurity of data and we want to make sure that the kinds of standards that we lay out, as the federal part of this, resonate with you all and are reaching every corner of this country so people are understanding expectations around privacy and security. And that blends into changing the culture of data sharing in this country, for too long and even today, we think about data as something that we have to hold tightly on to, it is built into our DNA of medicine that we want to hold data and we're worried about exposing it because we don't want to violate HIPPA. Consumers are expecting that we share their data and HIPPA allows it, which is way why have the office of civil rights to understand what it is and it is not, not just for the providers, but the folks in compliance and for consumers, and the work that we're going to keep doing is making is sure that we are lifting up that message so we can get people to understand that data should by default be held securely and privately, but it needs to be so on behalf of the consumers. And finally, we have been hearing very clearly that there needs to be a better case for sharing data. We spent very much of this effort on creating a payment case in the health care environment, and what you heard earlier today about researchers who are creating an additional business case for data sharing where we can see the acceleration of science and the revolution on the forefront and that's an addition where we can help data to get pushed and also pulled. We asked for many in the field to work with us in addressing these drivers of success to do it in a way that it wouldn't just be the federal partners, but a public/private partnership and we asked for people to take a pledge publicly about three commitments. Consumers should have access to their electronic health care information where and when it matters to them, we should not engage in health information blocking that is unreasonable, and we would agree to move to federally recognized national standards, including those around privacy and security, and you have heard a lot about that today in how it is being brought to life and it is flowing appropriately and we are moving to a set of standards that move us to a seamless flow of data and community of health. We are working to do our part on that end and we believe that one of the ways that we can continue to advance on those commitments is to push for market transparency, and one of the things that we want to make sure you are aware of, tomorrow, we are going to be posting on the website healthIT.gov/transparency a detailed listing of easy to understand information about certified health IT. It will be, on this website, what we have available now and we will update, this is to put plain language out there for providers wanting to purchase health IT. I had to do this several times looking to purchase, it but it can be confusing. We want you to see this is a way to let folks know what they are purchasing and allow for a more transparent marketplace. And we asked vendors to say what actions they are going to take to support more transparency and many are moving to be more transparent on the website. So I encourage you to take a look and give feedback on ways to improve it. All of these efforts, whether creating road maps with you or setting guide posts through the rule making process, working with partners to create a business case for advancing interoperability and improving health IT, or putting a challenge grant so health records are a tap away, or to collaborate with you, we know that we cannot do this alone. It requires strong partnership from those already invested, and we need to make a tent big enough for consumers, investigators, and researchers that want to begin this journey and entrepreneurs that will show us ways to improve the health of this country that we have not been able to imagine. So thank you for getting us successfully to this place and for helping us see where we are in data exchange, interoperability, and for the many purposes you are using it today and thank you for being with us this week as we roll up our sleeves and think about the how, not just the what, and close it off with the who, the consumer, because that's who we are here to serve. The new system to transform military health records has an official name. 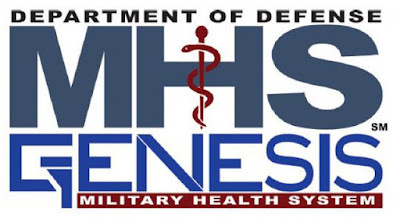 Military Health System (MHS) officials say the new electronic health record (EHR) will be called MHS GENESIS and will launch at the end of calendar year 2016. To keep pace with medical advances and innovations in technology, the DOD has purchased a new state of the art EHR that will support us in our mission to continue to provide high quality healthcare to our beneficiaries, as well as an agile, responsive system for our healthcare professionals. The configuration and deployment of MHS GENESIS constitute a multi-year effort to provide a state-of-the-market system of sharing health records electronically and documenting the continuum of care. The new EHR will begin implementation in the Pacific Northwest at the end of this year, followed by a pre-planned, programmed installation expected to be completed over a several-year period. Whether on a ship at sea, at a local clinic, or in a major hospital, MHS GENESIS will be available throughout all Department of Defense facilities, and accessible to all members of the DoD's healthcare team. While on the surface it appears just a system for health records, Dr. William M. Roberts, a retired Navy rear admiral who serves as the MHS functional champion, said it really reflects a whole new way of doing business for the MHS. "We've looked at this process as finding what is best for the MHS as a whole, not just in individual areas," said Roberts. "We see this as the latest step in making sure patients are able to be fully engaged in their own health." "We want people to know MHS GENESIS is a safe, secure accessible record for patients and health care professionals that is easily transferred to external providers, including major medical systems and Department of Veterans Affairs hospitals and clinics," emphasized Roberts. "When our beneficiaries see this logo or hear the name, they'll know their records will be seamlessly and efficiently shared with their chosen care provider."